Until 2007, Donald Carlson's line of vases, bowls, and lamps were the mainstay of his business. 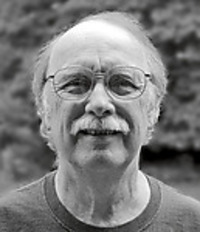 He and his wife, Karen, work together in their studio in Oregon. By accident, Karen brought Donald too much glass for the stem of an apple he was working on. As he pulled the stem up to cut, he saw a cherry. 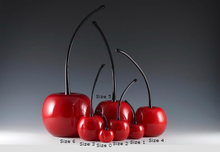 His whimsical grouping of cherries, ranging from 6" to 24", has put fun back into the art of making glass. The cherries are bright and fresh, and they delight everyone. Donald Carlson's work spans 5 decades and, in 1966, he created one of the first private studios in the world. While working with color, red, especially, has been both challenging and rewarding. "With over 42 years of experience, I have developed clean, well proportioned and eloquent shapes. In particular, it is my red glass that best reflects the Carlson tradition." 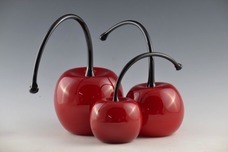 Donald Carlson has consistently produced a rich vibrant red that is unique in color and elegant in shape. 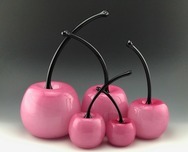 Without the use of molds, his work reflects well proportioned, clean lines. He makes every piece himself, with Karen's assistance, and each one is signed, dated, and recorded. For the discerning collector, it is rewarding to share in his progression of work. While finishing his MBA and MS, Donald Carlson took an art class. It was during these classes he discovered glass. Wanting to delve into the properties of glass and discover it's mystique, he built a studio in his back yard and taught himself to blow glass. He earned an MFA in glass as a result. After all these years, he has made over 60,000 pieces, and his work is sold in most of the finest galleries in the US.